Aged patients are underrepresented in clinical trials on catheter ablation of atrial fibrillation (AF). In addition, results of outcomes after repeat ablation in the elderly are lacking. We report the results of first repeat AF ablation procedures of aged patients from a real-world multicenter prospective registry. 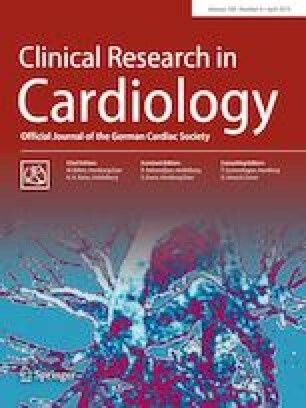 Patients undergoing second AF ablation included in the prospective, multicenter German Ablation Registry were divided in two groups (age > 70 years (group 1) and age ≤ 70 years (group 2)) and analyzed for procedural characteristics and clinical follow-up. 738 patients were analyzed (108 patients in group 1, 630 patients in group 2). Significantly more aged patients had structural heart disease (56 patients (51.9%) vs. 203 patients (32.2%), p < 0.001). The majority of the patients underwent repeat pulmonary vein isolation (101 patients (93.5%) vs. 593 patients (94.1%), p = 0.98). More aged patients underwent ablation of left atrial linear lesions (78.1% vs. 57.3% of all linear lesions, p = 0.027). There was no difference in the occurrence of peri-procedural complications (7 patients (6.5%) vs. 24 patients (3.8%), p = 0.30). Recurrence of atrial arrhythmias was documented in 45/105 (42.9%) and 252/603 (41.8%) patients with available follow-up in groups 1 and 2 after a median of 447 (400; 532) and 473 (411; 544) days (p = 0.84). A comparable amount of patients were asymptomatic or reported symptom improvement after repeat ablation in both groups (80% (80/100) in group 1 and 77% (446/576) in group 2; p = 0.57). Repeat ablation for AF in elderly patients can be performed with safety and efficacy comparable to younger patients. The online version of this article ( https://doi.org/10.1007/s00392-019-01471-5) contains supplementary material, which is available to authorized users. This work was funded by an unrestricted grant from foundation ‘Stiftung Institut für Herzinfarktforschung Ludwigshafen’ (Ludwigshafen, Germany). Dr. Metzner received speaker’s honoraria from Medtronic. Dr. Willems received speaker honoraria from Abott, Boston Scientific, Boehringer Ingelheim, Bristol Myers Squibb, Bayer Vital, Acutus and study funding from Abott, Boston Scientific and Acutus. Dr Eckardt consulting fees/speaker honoraria from Bayer Health Care, Daiichi Sankyo, Pfizer, Bristol-Myers, Squibb, Boehringer Ingelheim, Johnson&Johnson, Medtronic, Boston Scientific, Abbott, Novartis and research support by the DFG the German Heart Foundation. Dr Brachmann received consulting fees/honoraria from Biotronik, Biosense Webster, Medtronic, Boston Scientific, and St. Jude Medical. Dr Rillig received travel grants/lecture fees from Biosense, Hansen Medical, Medtronic, EP Solutions and St. Jude Medical and participated at the Boston scientific EP-fellowship. The other authors report no conflict of interest.